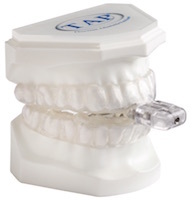 TAP stands for Thornton Adjustable Positioner and is a simple, patient-friendly treatment solution for snoring and sleep apnea. Similar to other oral appliances, the TAP holds the lower jaw in a forward position so that it does not fall open during the night and cause the airway to collapse, which helps to reduce snoring and improve breathing. Through this unique design, your patient can easily fine-tune his/her treatment at home while working with you, the dentist, to achieve the best results. Patients are encouraged to manage the degree of the lower jaw protrusion over as many nights as it takes to achieve the optimal treatment position. It has a single point of central adjustment, which helps to prevent uneven bilateral adjustment that can create an irregular bite and discomfort. The TAP 3 Elite is the most current design of the TAP Series that allows for greater adjustability and comfort. 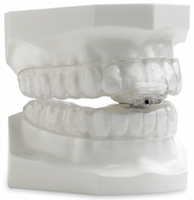 It contains a new double lingual bar design to improve the patient’s experience and durability of the appliance. 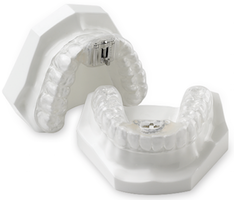 Contact us to learn more about the TAP Series and which option might be the best solution for your patient’s treatment.